The demonstration was organized by the Haitian American Grassroots Coalition, Institute of Justice and Democracy (IJDH), Florida Immigrant Coalition (FLIC) and Free Haiti Now, all groups which had been expecting Obama to reverse the Bush administration's denial of TPS to Haitians last December. 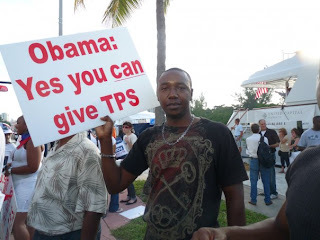 "We are all frustrated that more than nine months after President Obama's inauguration Haitians still don't have TPS despite the incredibly broad editorial and political support for it, including from the three South Florida Republicans in the US House of Representatives," said Steve Forester, an immigration lawyer and long-time TPS advocate who presently represents the IJDH in Florida. "And we are doubly surprised that we have not yet gotten a response to our request to at least give people the dignity of the right to work while the administration continues, month after month, to review the propriety of granting TPS, which to us and every objective observer is a no-brainer, based on the four hurricanes and storms that hit Haiti in a one-month period a year ago." "We need the administration to grant TPS or at least, while they are considering it, to grant work permits on a case by case basis to TPS-deserving non-criminal Haitians who desperately need work permits, drivers licenses and the ability to feed their families, pay electricity bills, and send remittances to Haiti which can support up to ten times that number, thereby increasing Haiti's security and our own," Forester said. Further down the sidewalk, a group of about 100 racist, anti-immigrant Republicans, Minutemen, and counter-revolutionary Cubans protested Obama's presence in Miami with absurd signs like "Go back to Kenya" and "Go back to Indonesia" and "Obama = Communism." In March, former Haitian-American unionist Patrick Gaspard, now Obama's Director for Political Affairs, traveled to Miami to soothe and reassure Haitian leaders that the administration would soon act on TPS. The reprieve he brokered has now expired. "As far as we are concerned, regarding Haiti, the Obama administration is maintaining the same status quo as the Bush immigration policy,'' Haitian-American Grassroots Coalition president Jean-Robert Lafortune told the Miami Herald.